Today is the start of the National Retail Federation’s Annual Convention & Expo, inarguably the largest and most influential show for the retail industry of the year. According to NRF, 89 percent of attendees play a role in purchasing decisions, making “Retail’s BIG Show” a perfect new business opportunity. Trade shows have always been a valuable asset to B2B sales. However, what’s changed over the past few years is the role that social media plays in a brand’s success at those shows. To understand the importance, just type in #nrf16 to your Twitter feed and you’ll see hundreds, if not, thousands of tweets over this week commenting on the various exhibits and speakers at this year’s show. However, brands often miss this opportunity to engage attendees by not using social media to its full advantage. Here are some ways that brands miss the boat on social when attending trade shows and how they can better optimize their presence for social. Selling instead of educating – Many brands use these high-profile events to tweet about a new product or service offering throughout the conference. However, this message often gets lost in the shuffle with hundreds of other brands also announcing a new solution. In order to stand out, B2B companies should instead educate attendees with useful information in the form of a groundbreaking data study or white paper giveaway. When you provide valuable information, attendees are more likely to mention your brand on social and keep you on their short list when it’s time to make a purchasing decision. Taking a back seat – Having a booth at a trade show is a good start, but brands who want the largest number of social mentions should look to have a thought leader speak during a session. An eloquent, well-spoken thought leader that can engage an audience provides a tremendous advantage. Not only do you make a strong impression among those attending your session, but those who are live-tweeting will amplify your message to their followers, which will create greater brand exposure. Too promotional on social – If all you’re doing is tweeting press releases and telling attendees to visit your booth, you’re missing an opportunity. Instead, monitor the trade show’s hashtag and engage on relevant topics that attendees are tweeting about. It’s much easier to do this when you have several team members working, both on the floor and monitoring the show’s hashtags. 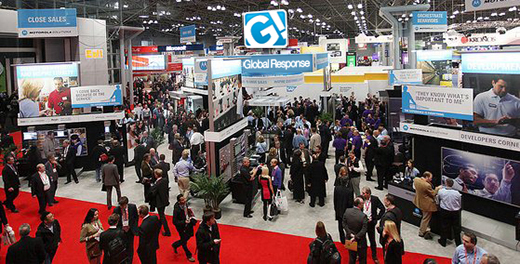 SAP, for example, often has over a dozen representatives manning their social channels at NRF. This way, it can keep up with relevant conversations and can stand out from the pack. Nothing “tweet-worthy” at the booth – Setting up a booth at a trade show isn’t cheap. Brands often take the first step in purchasing a space to display marketing materials, but then do themselves a disservice by neglecting to make the space interesting to visitors. Instead, provide value by offering a fun demo, a giveaway with anything from coffee to branded pens or a unique, interactive experience. When you make your booth more creative, trade show attendees are more likely to tweet about you and will be more interested to learn more about your business after the show. Not taking advantage of networking – Going to a trade show and not attending a happy hour is like going to a dinner party and only hanging out with your close circle of friends. While much of the conversation will happen at your booth or during the sessions, those happy hours are the perfect opportunity to make a strong impression. Trade show attendees often check in at a happy hour when given the chance and will tweet about their new connections or provide a referral to a friend. Marketers often overlook the time outside of the show, a mistake which can cost valuable relationships and overall provides less value for you as an attendee. Trade shows no longer have a one-dimensional relationship. The brands who are most successful and get the highest ROI are the ones who use social media effectively to engage with attendees and give people a reason to talk about them. You can read more about how we help brands accomplish this with our PR strategy. How do you engage at trade shows? Tweet us at @LRGMarketing and let us know your thoughts.